While biocontrol agents come in different shapes, often taking a lot of time for scientists to research, test and produce, natural ones always seem to be the better option. Now that Drs. Taveras and Hansson have discovered a new parasitoid wasp species in the Dominican Republic, they might have not only met the worst natural enemy for a widely spread invasive pest corrupting a large part of the essential pigeon pea crops. They are likely to have found a whole new field for investigation into the potential weapons against the eradicator of up to 76% of the essential crop. Their study is available in the open access Journal of Hymenoptera Research. 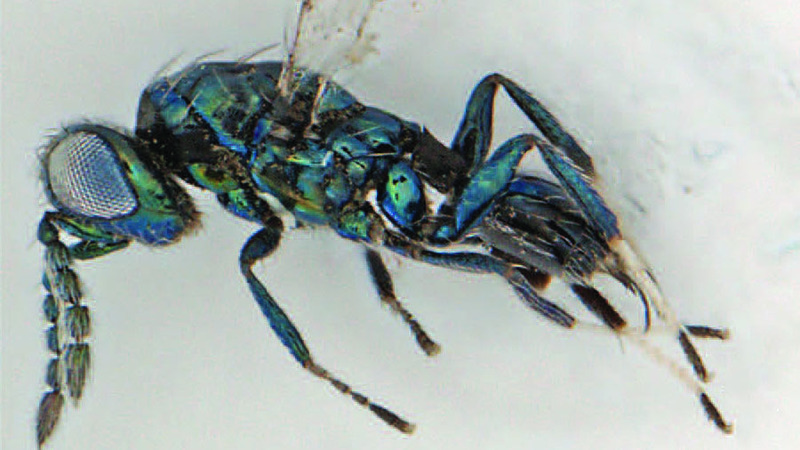 The find of this new gregarious endoparasitoid wasp, called Pediobius cajanus, is also the first time representative of this genus has been retrieved from the Asian fly. This invasive pest is estimated to destroy a huge part of the pigeon pea crops, a culture which is an essential food source for tropical America, a large part of the export and even has medicinal value. Therefore, the new species is very important not only in terms of the exploration of the biodiversity in Latin America, but also in economical sense. Even when treated regularly with insecticides, the Asian fly manages to corrupt as much as 27% of the Dominican pigeon pea crops, a previous study shows. Although a precise figure of the damage cannot be provided due to large variations between localities and the impossibility of tracking the whole span of the pea cultivation areas, there is the case of the town of Rancho Los Vargas, Puerto Plata, where in 2012 the loss of the culture reached 76%. On the other hand, the new wasp species was found to kill an average of 25% of the Asian fly larvae in the researched areas. In comparison, the previously known enemies of the pest are accountable for only 2%. This is why the scientists are now proposing the new species as a biocontrol agent. In conclusion, the authors suggest that the parasitoid wasp is likely distributed across a much larger area. They believe that the new species could also be found over the entire island of Hispaniola, on neighbouring islands in the Caribbean and even in the tropical parts of the mainland in the Americas. Its record and distribution both call for a further investigation into the potential implementation of the wasp in controlling the Asian fly.